Photo by Jason Cook in the Torontoist Flickr Pool. The TTC has launched its new anti-harassment effort, #ThisIsWhere, highlighting cases of violence, unwanted attention, and discrimination on public transit. The campaign, which rolled out earlier this month, features stories reported to the TTC that have occurred within the transit system. Posters on buses, streetcars, and subways read, for example, “#ThisIsWhere Ali was targeted because of her identity,” or “#ThisIsWhere Jamal was held up over a handful of change.” Posters are placed above windows, alongside other ads, as well as unique spots such as doorways and behind seats. The campaign will continue to roll out in new ad spots over the coming weeks. The campaign also includes the new SafeTTC app. The app can disable the camera shutter sound and flash on a user’s phone in order to discreetly take a photo of a perpetrator and send it to authorities. If there is no Wi-Fi or cell signal available, the photo will be saved and sent as soon as there is a connection. Terri-Lynn Langdon, an activist and member of the City’s disability, access, and inclusion advisory committee, first called for such a campaign last July in a deputation before the TTC board. Now that the campaign has launched, Langdon says she does not see it as addressing the systemic violence on the TTC. She also points out that the current campaign is not accessible for everyone who takes the TTC: those living with blindness, for example, are unable to use the app, as are those who do not have cell phones. “The project of access needs a budget, the project of safety needs a budget,” says Langdon. 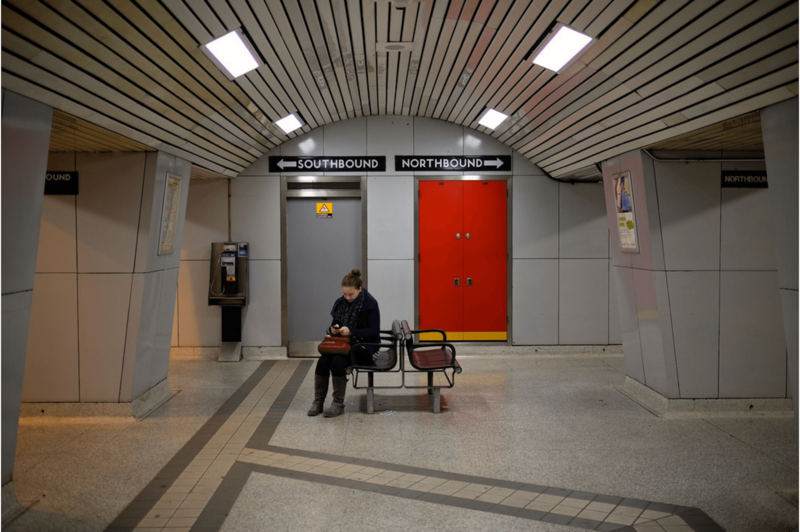 Langdon also advocates for additional anti-harassment improvements to the TTC, such as the installation of direct-to-dial distress centre phones or the removal of bus shelter ads that can obscure lines of sight and allow perpetrators to strike in semi-privacy. In a July Torontoist story about sexual violence on the TTC, multiple women shared their experiences of sexual violence on the TTC and called for greater focus on addressing sexual violence and education around being an active bystander instead of issues like fare evasion. Susan Sperling, communications manager at the TTC, said that as of July, the transit commission has received 35 reports of non-consensual touching of a sexual nature. There were 85 reports last year and 67 in 2015. Sperling says those figures represent incidents that have been reported to the TTC directly, and do not include reports to the police.